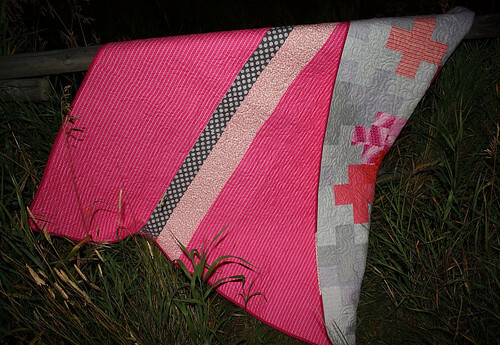 I recently finished my Pink Pluses Quilt and I am so excited to donate it to a great cause tomorrow! I mentioned in an earlier post that an all pink quilt was a bit out of my comfort zone so I balanced the donated pink fabrics with some gray prints and lighter pink prints from my stash. I honestly couldn't be more pleased with how well the fabrics blend together. When contemplating what to make with a collection of donated pink strips, I thought hard about how I could make something special, yet something that still felt like it had a small piece of me in it. In the end, I went modern with the design and used a number of gray geometric background prints to balance out the bold pink floral pluses. Since this quilt has a very feminine colour scheme, I thought I would try my hand at some swirl quilting to soften the edges of the plus pattern. It was my first time attempting this design but I know it won't be my last. I'd like to try this again soon. The texture it creates is so soft! For the backing I kept is simple, a dominant pink fabric with a couple of modern prints to balance it out. I wanted the back to emote a similar balance of modern femininity and I hope this back reflects that. I took these photos at sunset (which unfortunately doesn't translate at all in the pictures) and you can see I was loosing the light quickly! If you'd like to read more about the Southern Alberta flooding and how it effected my city, I have an early post here. It has been incredible to watch the outpouring of support and donations sent in from the quilting community for this cause. I hope this quilt brings some comfort and love to a much deserving family. I'm linking up to TGIFF and Finish it up Friday. You nailed it! It's absolutely wonderful. It looks absolutely perfect Kelsey! 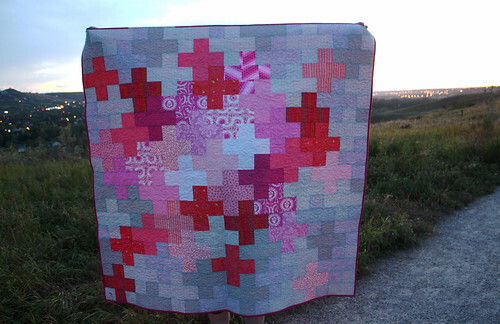 I love the quilting you went with, great job! And i love the mix of grey with pink, still feminine but not girly, girly! Awesome finish! It looks fantastic Kelsey. 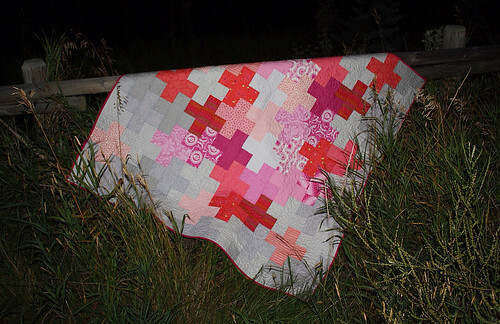 The quilting is great, and I just love the Albertan backgrop! This is beautiful! 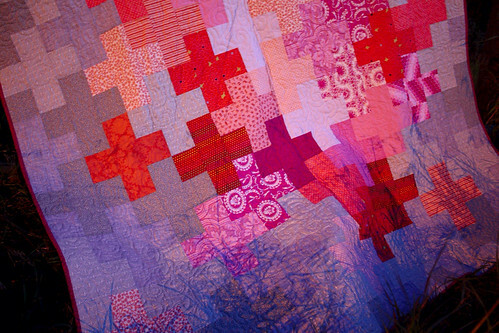 I love how the bright colors burst in the middle and fade out on the sides of the quilt! Great design. I am quite partial to pinks, they are so warm and cheery. I love how you combined the pinks with the greys. Stunning! This is just beautiful! 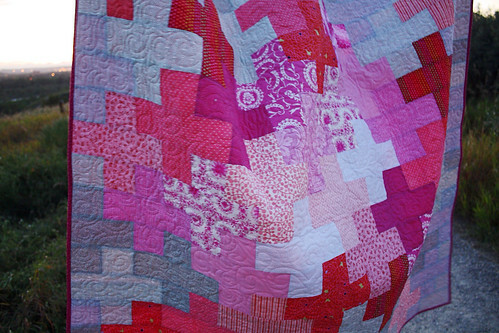 I have stacks of pink fabrics--not sure why--I had a boy, not a girl--and this is a great design. Absolutely gorgeous front and back. Ooh that's gorgeous. thanks for linking up! Beautiful finish! I'm sure it will be well loved in its new home. Gorgeous! Just the right balance of pink with the gray! 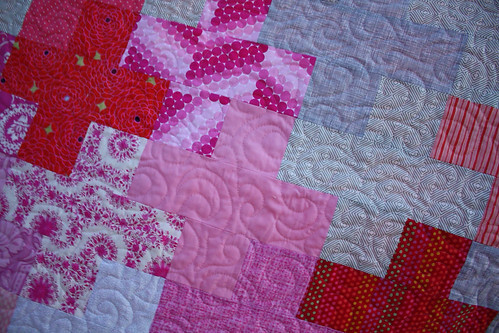 Love the quilting.... You did a super job! Congrats on a wonderful finish! It's lovely Kelsey, the grays tone down the pinks beautifully and there's such a lovely tonal mix. I'm sure it'll bring much delight. I love this!!! the colors are awesome...totally going to have to make one now that I saw yours. Awesome Job!! !